This competition entry was a collaborative effort with our good friends and colleagues at the office of Jeff Jordan Architects LLC. Our entry employed a series of transverse axes, derived from the region’s historic ‘ribbon farms’, to stitch the river and the city – providing physical and visual connections. The goal was to use the park to re-establish meaningful connections by stretching it back into the urban context of the city and extending it out into the natural ecology of the river. Strips of the park reach out into the river while others pull back to reveal the historic riverfront edge and native ecology. 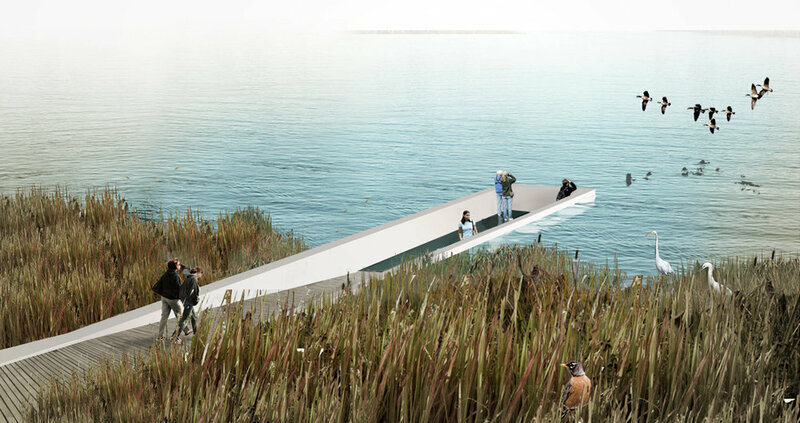 The new park offers new ways to experience the river whether from above, beside or in the case of the inverted pier, within the water. The Woodward Ave Boulevard of Monuments is an extension of the iconic avenue through the park and to the edge of the Detroit River as a pedestrian street. The South Pier extends into the river and serves as a home to the Downtown Detroit Sailing School, public boat slips and a kayak launch. 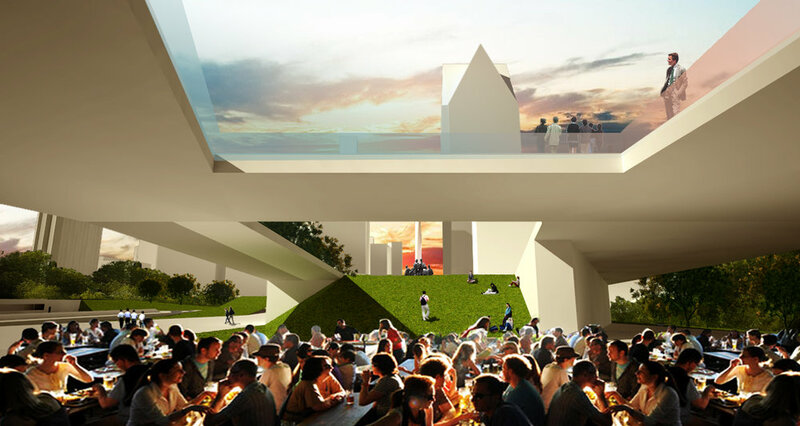 An outdoor Beer Garden and Restaurant beneath the terminus of the Boulevard of Monuments offers framed views of the skyline and tables near the water with unparalleled views of activity on the river. An Ice Rink and Tennis Courts share space depending on the season. In the cold of winter, the rink allows public skating and hockey games while in warmer months the rink is removed to reveal public tennis courts. The Inverted Pier is a walkway that passes through an area of dense native vegetation and down into the river. Extending out into the river and below the water line, park users are encouraged to experience the river in a new and exciting way. The Museum of the Automobile occupies one of the pedestrian bridges that span the newly submerged Jefferson Avenue.